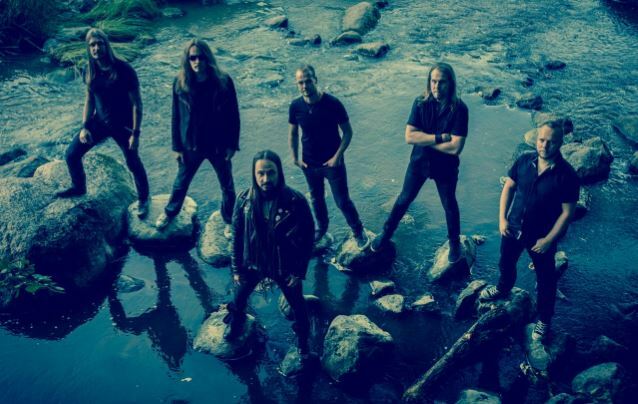 Finnish melancholic dark metal forerunners AMORPHIS have started the year off by demoing songs for their upcoming twelfth studio album, due out in September. The band will start pre­production this March in Helsinki with producer Jens Bogren. The CD recordings will begin in April at Bogren's Fascination Street Studio in Sweden. The lyrics are written by AMORPHIS' spiritual mentor, Pekka Kainulainen. "Like 'Kalevala', they are descriptions of natural phenomena, seasons and the human mind," says Kainulainen. "Reoccuring situations where hope and uncertainty alternate. Attempting to gain advice from higher powers. The poems do not form a complete story per se, but they are drawn together by a certain theme. We live under a red cloud and once again, time weighs us." The release of AMORPHIS' new album will be followed by a world tour, starting with shows in the band's home country. AMORPHIS will the then hit the road in Europe with NIGHTWISH at the end of the year. This past December, AMORPHIS completed a successful Central European "retro" tour where the band played its legendary "Tales From The Thousand Lakes" album in its entirety to celebrate the CD's 20th anniversary. As a special treat for the fans, AMORPHIS also played songs from its debut album, which it hasn't played in more than two decades. In Germany, the media praised the tour of its authencity and its "time travel to 20 years ago" aspect. AMORPHIS' eleventh album, "Circle", was released on April 19, 2013 via Nuclear Blast Records. Production and mixing duties for the follow-up to 2011's "The Beginning Of Times" were handled by HYPOCRISY and PAIN mastermind Peter Tägtgren, who has previously worked with such bands as CHILDREN OF BODOM, CELTIC FROST, IMMORTAL and DIMMU BORGIR. The recordings took place at Petrax Studio (NIGHTWISH, CHILDREN OF BODOM, KORPIKLAANI) in Hollola and 5K Studios in Helsinki. The cover artwork was created by Tom Bates (BLEED FROM WITHIN, DEVIL SOLD HIS SOUL).